I don’t make New Year resolutions or set myself lists of targets or challenges – I don’t like the pressure. I don’t need it. That doesn’t mean, however, that I don’t randomly decide to do things that stretch me a bit. For instance, I made a pair of jeans recently that stretched me but, ironically, didn’t stretch enough themselves to fit me comfortably. As you know, I’m making a coat at the moment which is also promising to be a challenge but, hopefully, will fit me at the end of it. I also decided to do Dry January again which is a challenge every year and I’m sure they add extra days to the calendar. (For those who are not overly concerned by alcohol related matters, this means not a drop to pass my lips throughout the month of January 😱). I did briefly consider continuing the abstinence forever but, as I found myself literally counting up how many days were left until 1st February when I was out walking the dogs the other morning, I really don’t think that’s going to happen. It’s been harder this year as Mr. Tialys didn’t join in so I’ve had to watch him glugging sipping a glass of wine with his dinner while I’ve noticed that both the frequency and quality of my kitchen dancing has deteriorated since the 31st December. Anyway, back to the crafting. 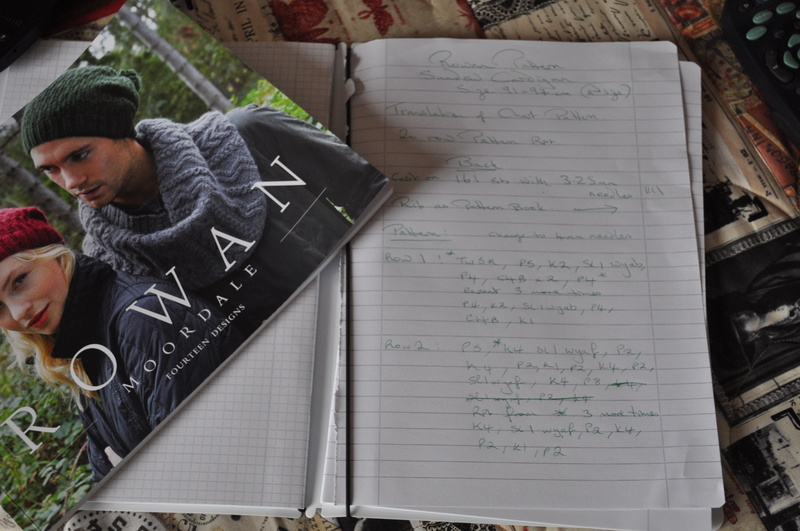 I spotted a new yarn by Rowan the other day and also a lovely book of patterns using the yarn designed by Martin Storey. I fell in love with this cardigan and decided to ditch the hook for a little while and take the needles up again. My last knitting projects were a pair of socks knitted on a teeny circular needle and a cabled blanket knitted on a massive circular needle. It felt strange to be holding a pair of needles again and even stranger to contemplate working from a chart. I usually prefer written instructions and have actually translated the first couple of rows but I think, once I’ve got those under my belt, I’ll be able to just go with the chart. 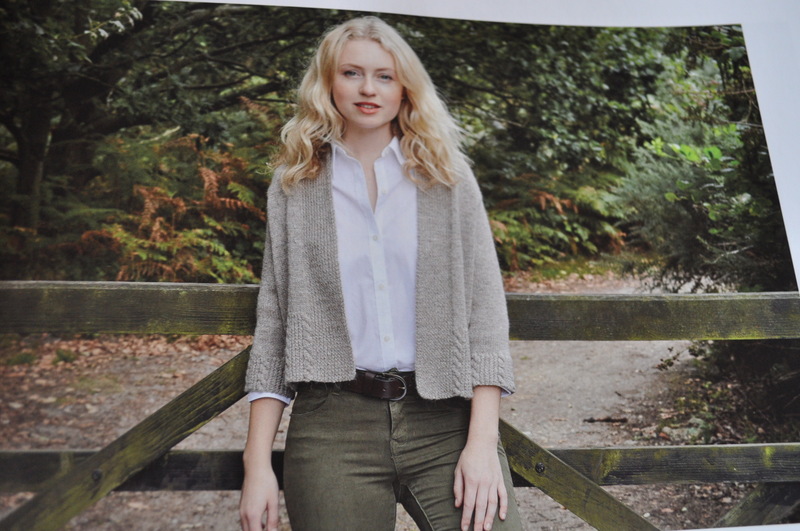 The beautiful yarn used is Rowan Moordale with is made with British wool and alpaca – however, it costs around £16 for a 100g skein which would make this cardigan cost almost £100. 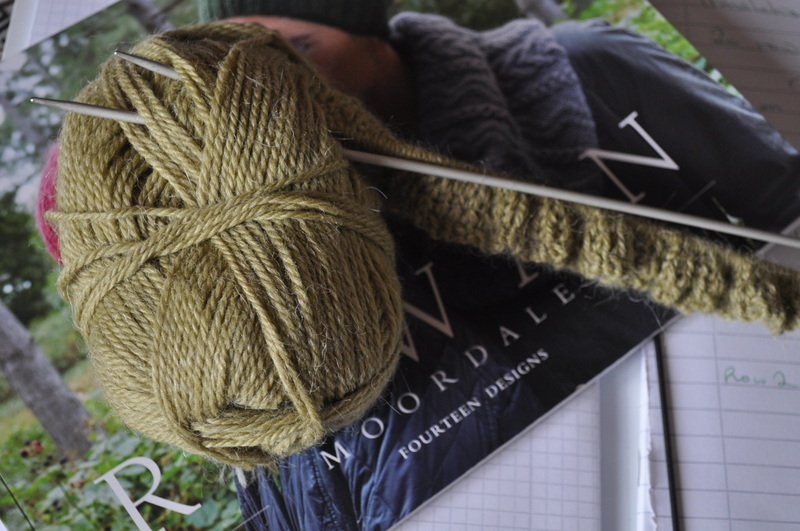 I baulked at that a bit – especially since I haven’t knitted anything this complicated in a while. The patterns says ‘expert knitter’ which, although I’ve been knitting since I was knee high to my mother, I’m not sure is how I’d describe myself. I recently found a site called Yarnsub which will suggest alternative yarns to use if you can’t afford/can’t find/don’t like the one specified by the pattern. They grade the suggested alternatives by taking into account the density, the ply, the appearance, the cost, etc. and put them in order of suitability. One of the top ones in this case was a Bergère de France yarn called ‘Lima’ which has the same amount of wool (though French rather than British) and alpaca and the same ‘haze’ on the finish. Lima comes in 50g balls – as opposed to the 100g Moordale skeins so I needed to buy double the amount, with a little extra just to be safe. I went on the Bergère de France site and found Lima to be discontinued so they had it on sale for half price – only £2.20 for 50g which means, if I ever finish it, it will cost me less than a third. You’ve got to love the internet at times like these. This is the colour I’m using, it’s a muddy kind of green called ‘Mangrove’ which sounds horrible I know but I think it’s a colour that will be useful as it will make a change from the greys and blues I usually go for. As I had purchased the pattern book, and there’s some other nice items in there, I went back online and bought some more Lima in a blue colour. I’m thinking about using it for this one but Mr. Tialys says it looks like it’s been put in the wash and shrunk. Personally, I like the cropped body, but do you think it would spoil the style if I made the sleeves full length? 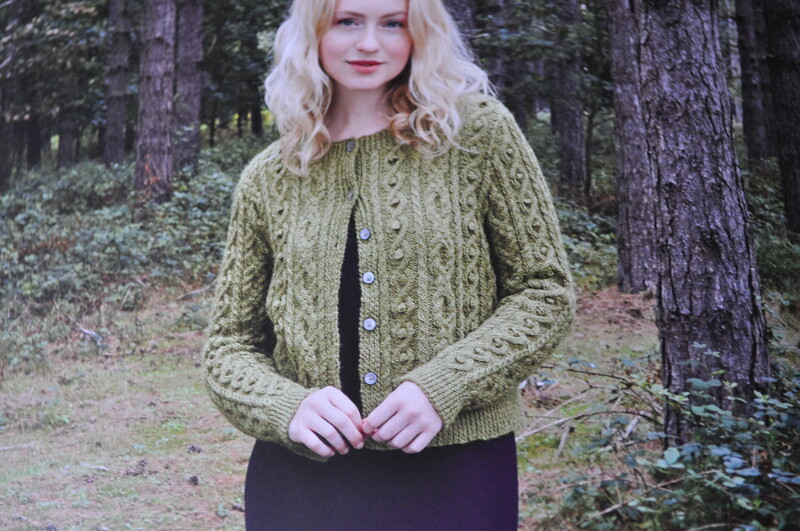 I will have plenty of time to make a decision as I don’t anticipate finishing the heavily cabled cardigan before next autumn – it’s not one I can do in front of a Netflix box set that’s for sure. 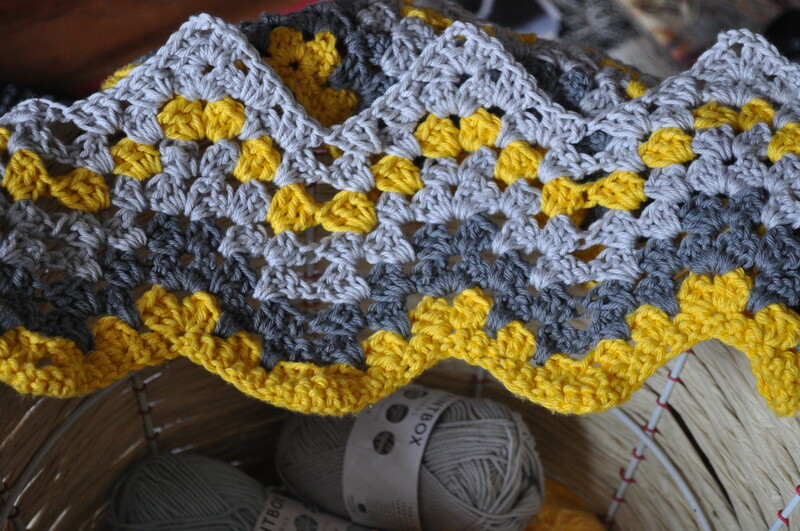 There is a baby on the way in the family though (for my niece) and I can crochet a stripey blanket while immersed in real life crime stories or a drama that manages to drag on for 24 episodes or so. I’m using the ‘Little River Blanket’ pattern again but, as I am reliably informed by my sister and Cathy who is given very particular instructions when knitting for her grandchildren, grey is on trend for the tot about town. Who would have thought it? I can’t possibly make it all in grey though – even if those greys are in slightly different shades. 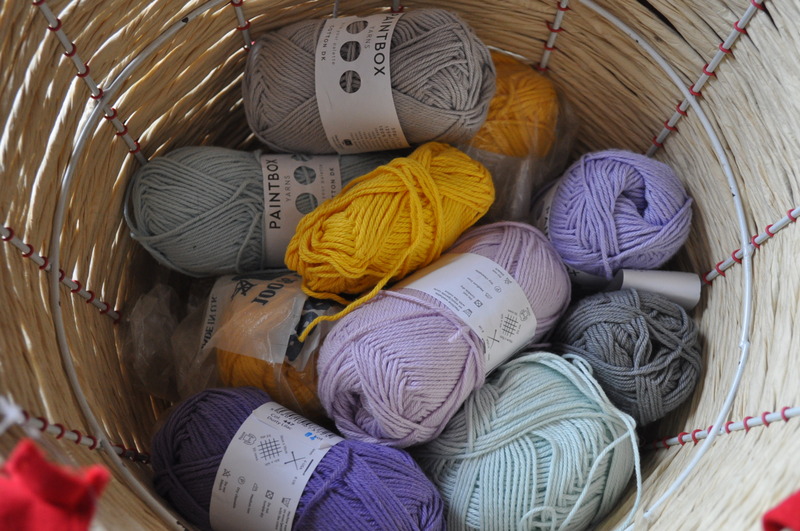 I’ve got two big packs of cotton yarn – one 50g ball in each colour of the Paintbox range and also, in my stash, some sunny yellow Rowan cotton yarn which I thought I’d use for the first and last rows, and the highlight on every 5th row as stated in the original pattern. This is it so far. I’m intending to switch subtly between grey through lilac through duck egg blues – don’t know about the middle yet – then repeat in the opposite direction for the other end. The gender of the baby is unknown. The niece might consider the yellow too bright. If it’s not ‘baby appropriate’ by the time I’ve finished it, I will still like it myself and I’ll just have to whip up a quick baby hat or something for the niece’s baby as it’s due in February some time.